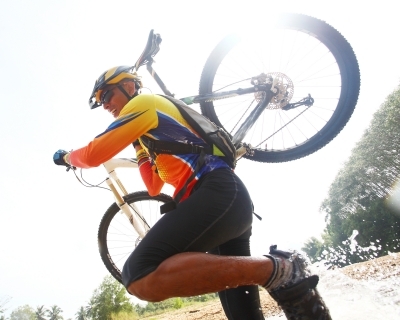 Strength training in endurance sports like triathlon is one favorite topic of debate. In the ideal world, the top athletes incorporate some strength workout that includes weight lifting into their training. However, in practice, everyday people who are not after award plaques find that including some form of weight lifting to an already full schedule of biking, swimming and running more of an exception than a rule. Is it really necessary? Will you benefit from it? One common misconception is that strength training is just ‘all show, but no go.’ It can look great on a man’s body form, but it does not contribute to performance on endurance races. It takes more effort to move especially in running and biking, and is just considered a waste of energy and training time. Women who race also have a misconception that weight lifting can lead to a bulky figure. It is for this reason many women do not even attempt to do any necessary weight training for a race. Sadly, these are just misconceptions. The fact of the matter is strength training is a necessary foundation for any athlete’s performance and overall health. This is especially true for new or young triathletes. Strength training allows you to develop your support muscles for stability. New athletes are often more injury prone than veterans. Their lack of experience can lead to risks, and these risks can take a toll on their bodies. While pushing one’s self to go beyond your limits is important, you do not want to be sidelined or in need of medical attention due to major injuries. While strength training is important to include in a triathlon training programming, it should not take away your time on the bike, pool, or track. One should consider it as a supplement to training rather than a replacement. Consider workouts that use weights that encourage natural movement. Use kettle bells, drag logs, or move stones for functional strength. Don’t try to do everything at once. For a good progression and to minimize fat gains, build strength gradually. Maintain a steady progression to avoid muscle soreness that can take away your time running, swimming and biking. Weight lifting or strength training should be included in one’s triathlon training. The benefit of added strength and stability as well as the prevention of injuries outweighs the time and effort needed for it. Don’t wait until you are injured to do it. But, always keep your strength training balanced. Lincoln Davis earned many trophies in his younger years as an amateur triathlete. A part-time coach, he is currently working as a design consultant for a trophy and medal design company.